Howdy! How’s your summer going? I am here today with a tropical card. This is my first time using this fun Reef Border die. I have had my eye on it for quite some time. My thoughts went to rainbow fish when starting this card. Does anyone remember that book? I decided many fish in rainbow colors. To start my card I put some Distress inks down on my craft mat and sprayed them with water. Then I took some watercolor paper and put that down on the watered down ink. I did a second round of that after my background was dry. I stamped the octopus and the jelly fish using Oxide Distress inks. The octopus and jelly fish are from a Hero Arts My Monthly Hero kit. I used the dies from the kit to die cut them. I stamped the seahorse with a stamp from the Hero Arts set Color Layering Seahorse also using Oxide ink and die cut it with the matching die. The My Monthly Hero kit is no longer available but there is a Color Layering Octopus set in the a2z Scrapbooking store. Next I used the Hero Arts Reef Border die to cut out the border. I went all around the die cut and colored the sea creatures using Copic pens. You could leave the center open and stamp a sentiment in there but I wanted a few sea creatures there. I also did not want a sentiment on the border so I will stamp that on the inside later. Hero Arts Border Reef Die – This can be custom ordered at the a2z Scrapbooking store. Look for the orange Request Custom Order button on the left side of the page. Hero Arts has this die also. Categories: Handmade Cards, Hero Arts, Watercolor | Tags: border reef die, Copics, die cutting, Distress Ink, distress oxide inks, Hero Arts, Karen, watercoloring | Permalink. Hello, hello! Erica on the blog today, from our new house AND new country! Oh yes, we don’t do things by half around here. “Let’s move”, “Sure thing, hunny-buns, which country shall we go to this time? ?” is more like our MO. Right now, I’m sitting on the sofa in a half-unpacked house in POLAND, having only moved here from Denmark 8 days ago and got the keys to the house 6 days ago. The craft room is almost all sorted because ya know, #priorities. The bedroom and kitchen are nearly as they should be too. The rest of the house? Eh, that’s gonna be a work in progress for a while I think. Tidy, schmidy will be my motto for at least a few weeks! Well, now that I’ve got that off my chest, shall we get down to some crafty business? I have two cards for you today, both made with the Hero Arts Woof stamp set and coordinating Woof Frame Cuts. These cards are quite different and I like being able to see different techniques being used with the same stamp set. If it seems really versatile, I’m more likely to buy it as it feels like more bang for the buck. I did my usual thing here when I got this stamp set, I stamped up loads of adorable little doggies and coloured them in. I think one of the reasons I do this is to get a good feel for the stamps and to try out different looks without “committing” to making a card right away. I did a few with Zig Clean Colour markers and some with Copic markers but for the cards today, I only ended up using the ones done with Copics. When I had a whole pack of puppies coloured in, it was time to start on the backgrounds. For these I used another couple of different techniques, both with lovely results if I may say so myself. For my first one I got some of those delicious Distress Oxide inks out and using a homemade cloud stencil I blended some Broken China blue around the stencil to create a sky. I did the same thing to make a grassy ground for the pups to play on using Cracked Pistachio green Distress Oxide inks. The dies I used to create the stencils are both from My Favorite Things. When it came to decide on a sentiment, I used one from the stamp set that says ‘You + Me Friends Forever’ and I picked a couple of the doggies that I had coloured in to look like my Cheeky Chicas (my two little rescue dogs, they are sisters and adopted from Spain hence the chica nickname and if you are curious to see them for yourself, here is a link to my Instagram where I post regular photos of their mischief) The sentiment I stamped in black ink on white card stock and then I used a Mama Elephant stitched cloud die to cut it out along with a plain white cloud and a bright yellow sun. In the Hero Arts Woof stamp set there are lots of cute little accents to make your card or project perfectly doggie-licious and I have used several of them for these cards. For the first one I only stamped up a couple of hearts and used the coordinating Frame Cut to cut them out. Now I had all the bits I wanted for my first card and it was time to assemble! This took very little time as I had a picture in my mind of how I wanted it to look. Using foam tape to create dimension and layers I glued away until I was happy with the results. A few clear sequins snuck on it too. For my second card I went in a more monochomatic style, even the doggies I used are grey/black-ish. The only colour splash are the little hearts and the ink blending on the word sentiment. Whilst my first card turned out pretty much as I had planned, this one did the exact opposite! At first I thought I’d stamp this up as background paper and colour it in using bright colours but I ended up liking it so much without any colour (*gasp of shock* I know, I know… surprise twist or what?!) and that is how the little pink hearts got added because I felt a little bit of pink wouldn’t hurt. They were not part of my original plan at all. I stamped these using Worn Lipstick Distress Oxide ink. As my little doggies were already coloured in, this card came together rather quickly once I decided to skip the colouring step. A stitched rectangle frame (good old Lawn Fawn to the rescue again) in black linen textured card stock, as well as the word die ‘Love’ which got an ombré pink effect with the help of the same Distress Oxide ink as the hearts are stamped, a white banner to stamp the sentiment on and some foam tape later, BAM! Done. That’s it from me today, I hope you have enjoyed this post and that my cards have inspired you to get your colouring on. Don’t forget that there is a marvellous colouring challenge going on for the month of September, called The Daily Marker 30 Days or check out the hashtag #thedailymarker30day. The idea is to have some me-time every day and colour a little bit, even if it’s just 5-10 mins. There is no pressure or commitment, it’s just plain fun and we can all use a bit more of that these days, can’t we? Anyway, with that, I’m off to organise, move some stuff around and attempt to learn some basic Polish… Or maybe I should just stick to crafting? Please join us in this months “CASE a Designer” challenge for your chance at a $25 gift card to the a2z store. Our current monthly challenge can always be found in the menu bar, and runs from the 1st to last day of the month. The a2z scrapbooking store carries a wide variety of Hero Arts products! Get discounted new releases, sales, grab bags & more. Proceeds from our store benefit Celiac & Behcets disease foundations. Use my discount code ERICA15 to get 15% off your purchase of $25 or more. If you’re looking for a Hero Arts product you don’t see in store, use the Request Custom Order button from within the shop. Categories: Clean and Simple, Coloring, Friendship Cards, Handmade Cards, Hero Arts, Stencil | Tags: animals, Copics, Diecutting, distress oxide inks, dogs, Erica, ink blending, sequins, stamping | Permalink. Hi friends! It’s my last post for a2z, I have sooo enjoyed designing with so many Hero Arts products alongside these amazing ladies; they are some of the kindest women you will find in this industry! I will miss them but they will never be far away! Don’t forget to use my discount code in the a2z Etsy shop – and if something isn’t in stock, just request a custom order – no additional charge: MicheleG15! I wanted to play with flowers, goodness – I just love colorful flowers! I hand painted (read that to mean, not so straight lines – HA) some thick lines with distress inks and Hero Arts ombre ink, then added some thin gold lines for my backgrounds. The 2nd step of the hydrangeas and leaves were stamped with Oxide Ink, I added more colors with Copics and spritzed with water. Once dry, I die cut the pieces and layered everything up over some gold thread. Oh…and the graphic black and white paper was picked up at Hobby Lobby, adds a nice punch to the black sentiment! Thanks for stopping by; hope you have a great weekend. And don’t forget this month’s challenge – SHAPED CARDS – link ’em up HERE! Categories: color layering, Flowers, Handmade Cards, Hero Arts | Tags: Cards, Copics, Flowers, gold, hydrangea, Michele Greenwood | Permalink. It’s Donna here to share this cute shape card made with the Hero Arts, “Nesting Clouds Infinity Dies”. The sentiment is from the Hero Arts digital file “Rain or Shine”, the background, the rainbow and clouds came from the Hero Arts digital file “April Showers”. I am loving the challenge this month which is “Take Shape”, you can use any shape card and use at least one Hero Arts product on your card to qualify for the prize. I wanted to let you all know this will be my last post on a2z Scrapbooking! I have enjoyed my almost three years with this design team. I will be back playing along with the challenges if time permits! I will always be a Hero Arts lover and will continue to use their products! Thank you Linda for the opportunity and I wish you and the store much success. So on to my card…………. I was so excited about getting my card together, I completely forgot to take pictures, but this is a simple card to created. 7. I finished the card off by adding some Hero Arts sequins called Ombre Ocean. Simple card! I can’t wait to see what you create on this fun challenge. Please join us in this months “Take Shape” challenge for your chance at a $25 gift card to our a2z scrapbooking store. Our current monthly challenge can always be found in the menu bar, and runs from the 1st to last day of the month. The a2z scrapbooking store carries a wide variety of Hero Arts products! Donna15 Get discounted new releases, sales, grab bags & more. Proceeds from our store benefit Celiac & Behcets disease foundations. Use my discount code to get 15% off your purchase of $25 or more. If you’re looking for a Hero Arts product you don’t see in store, use the Request Custom Order button from within the shop. Categories: Challenges, Coloring, Digital, Friendship Cards, Handmade Cards, Hero Arts | Tags: Copics, Hero Arts digital Rain or Shine, Hero Arts Nesting Clouds Infinity Dies, Hero Arts Ombre Ocean, shape card | Permalink. Join us in welcoming our Guest Designer for May, Linda Trace! You may know Linda from a lot of places, including co-founding A Blog Named Hero. Linda’s love of Hero Arts and her amazing talent maker her an ideal designer here at a2z Scrapbooking. Thanks, Linda, for sharing this cool card and teaching us to use Distress Oxides in a different way! It’s Linda, I’m super SUPER excited to be here today as guest designer for this month! I created a card that is simple, but really shows off the amazing products I used. Distress Oxides. Have you tried them yet?! I only needed to see one video of them in use and I was smitten. I’ve had them for a few weeks now and I’ve barely stopped playing with them–seriously amazing!! I wanted to really show how they stand ‘up’ off dark cardstock. To start, I created a top folding horizontal notecard using kraft cardstock, then I cut a panel of black cardstock to 5.5″ wide by 3 3/4″ tall. I took Broken China, Vintage Photo and Wilted Violet, and one by one, swiped them onto the black cardstock, pressing firmly, then lifting up off the cardstock, before I reached the bottom. I coloured the images in with Copic markers, that I matched to the swipes of Oxide. I then fussy cut around them, leaving a small white border. I added some white detail to the caravan and tent using a Molotow Paint Pen (but you could use these https://www.simonsaysstamp.com/product/Uni-Ball-Pen-Signo-Gel-WHITE-Two-Pack-1919994-1919994U?currency=USD). The sentiment, I stamped in Versamark ink, then heatset using Hero Arts White embossing powder. That’s it! Super quick and easy, but thanks to the oxides, it turned out so effectively. Categories: Coloring, Handmade Cards | Tags: Camping, Copics, Distress Oxides, Linda Trace, Road Trip | Permalink. Hi friends! This month we are celebrating “getting to know you”…well, really me! I’ve definitely been MIA but I’m back with this absolutely gorgeous flower, Artistic Dahlia from Hero Arts. I LOVE flowers AND stencils, so a match made in heaven! Have you joined our challenge this month? If not, show us your creations HERE! I stamped the image on Ranger water-color paper then colored with Copics and colored pencils, once complete, I outlined the entire image with a Sharpie. The background was created with Wilted Violet Oxide Ink and Hero Arts Moss; I shifted the stencil just slightly before adding the green. Once complete, I spritzed the panel with glimmer mist and splattered on some watered down Ranger black enamel accents. The stencil is Crossing Waves from Hero Arts. Don’t forget, you can purchase any of the Hero Arts items as well as many other items at the a2z Etsy store; if you don’t see something in stock; remember, they do custom orders. Be sure to use code: MicheleG15 to save 15% on your order! Categories: Coloring, Flowers, Handmade Cards, Hero Arts, Stencil | Tags: Artistic Dahlia, Copics, Flowers, Michele Greenwood, Prismacolor Pencils | Permalink. Hi Everyone, Kristina here featuring the new Hero Arts Holiday Animals set! With so many fun images in this set I wanted to create a little scene to use as many of the stamps as possible! I thought it would be cute to have some of the animals getting ready to decorate the tree! I stamped all my images and colored with copics, topped it off with some wink of stella (which I can never manage to capture in photo). I used a grey c3 copic to create a simple snowy landscape, and stamped my sentiment overtop. You can find this stamp set and many more Hero Arts goodies in the a2zscrapbooking store here If you don’t find what you’re looking for, just use the “Custom Order” button and they’ll make it happen! Hey, have you joined in on our challenge this month? $25 gift card to the store is up for grabs! Categories: Clean and Simple, Coloring, Handmade Cards, Hero Arts | Tags: Copics, Holiday Animals, Kristina | Permalink. Hi friends – welcome back to another fun layered card. Once again, I didn’t do the ‘typical’ layering with lots of different papers and such; instead, I made this fun circular card using different heights/layers. 😀 Does that count? I used the gorgeous Hero Arts You’re So Lovely flowers which I adore, stamped 2nd generation in red and purple, then colored with Copics. I die cut all the circles at once then mounted the 2 and 4th (from the outside) circles with foam tape for fun dimension. I then added some tiny glue dots and once dry, used rose gold foil for accents. The main panel is adhered to a circular card base which opens so you can include your message. 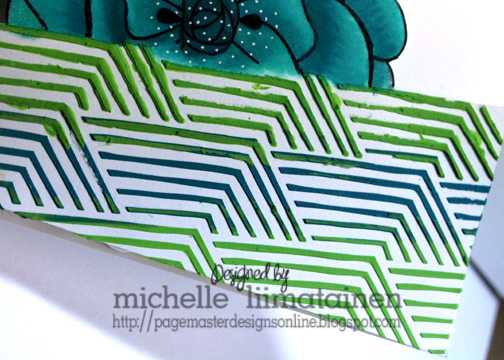 Thanks for peeking in; hope you’ll join our LAYER IT challenge this month! Categories: Coloring, Handmade Cards, Hero Arts | Tags: Copics, die cutting, dies, Hero Arts You're So Lovely stamp set, Michele Greenwood, Thinking of you, you're so lovely | Permalink. Hello everyone!!! Welcome to the month of March!! I hope it brings the much needed sun, birds and beautiful flowers. The winter can be such a downer!! Our new challenge is sure to bring about some bright colors!! Our challenge this month is Color It In!! Use any Hero Arts product to create a beautiful colored in piece. This will be super fun and interesting. We get to go back to the basic and color!! There are so many possibilities and so many different mediums that you can use for this challenge. Amazing isn’t it!! I hope you love what you see and that it inspires you to join us this month. You have the entire month to create a new project and enter it into Mr. Linky below. By entering you will have a chance to win a $25 Gift Certificate to the a2z Scrapbooking Store. Winner will be announced on the 7th of April. Good Luck! One more thing before I go, did you know that we are on Twitter, Instagram and Facebook?. If you haven’t done so already, please follow us on these different social media outlets!! You don’t want to miss out on any fun promotions!! Categories: Challenges | Tags: color me in, Copics, Watercolor | Permalink. HI everyone! Sorry about the late post today, there was a mix up. Anyhow, I am here with a one layer card and how it almost became pretty trash. I had a lot of fun and frustrations with this card. I am showcasing the Hero Arts/Basic Grey Art Deco Stencil today. 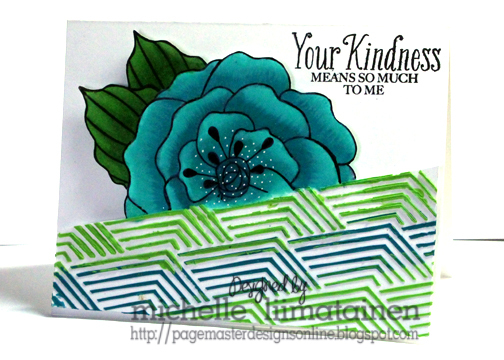 I created the one layer card using an older Hero Arts flower stamp and leaves and the newer HA/BG Art Deco stencil. I started by masking off the the bottom of the card and then masking the flower to put the leaves in. The flower and leaves were colored with my Copics. I used some new texture paste that I found at Michael’s. It says it is by ART. It comes pre-colored. I have to say that I was thrilled with how smooth it was and that I didn’t have to mix colors BUT…it dries super fast. If you use this paste I suggest you work really fast. I had to do this one twice because the top row of green dried before I finished. If you don’t want to use this paste then get the plain white we carry in the store and just use some ink to change the color of it. I think I will be doing that from now on. Live and learn. It’s art…it’s all about the process right? Take a closer look at stencil. I really love this stencil. I placed it on an angle and taped it down with some washi tape while I worked. I really love how well the stencil worked at an angle. I love that you get a good vibe of the stencil without having to use the whole thing too. I am going to be playing with this stencil again with just inks. I can’t wait to share it with all of you. If you would like to purchase this stencil it is in the store. If you order $25 or more you can use the code MICHELLE15 and get 15% off your total order. We all have mishaps that happen when we make cards. Do you save some of your “mistakes”? I would love to know that I am not the only one that does. Categories: Challenges, Coloring, Flowers, Friendship Cards, Handmade Cards | Tags: a2z Scrapbooking Store, Coloring, Copics, design team, Encouragement, Flower Cards, Hero Arts, Michelle, stamping, stencil | Permalink.